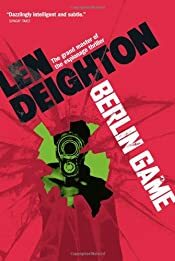 Clerkenwell Films is developing an 18-part made-for-television adaptation of the nine spy thrillers by Len Deighton featuring Bernard Sampson. Simon Beaufoy will executive produce. "Deighton's masterful series of novels draws the hidden political map of the late twentieth century," said Beaufoy. "It is all here: murders, honey-traps and spy swaps, the double-dealing and maneuvering of nations jousting for position at the height of the Cold War, with Bernard Samson, the Bond with brains, giving it an almost Chandleresque sense of cool." Ex-MI6 field agent Samson was introduced in 1983 in Berlin Game (details below), the first in the so-called "Game-Set-Match" trilogy. Two more trilogies of thrillers followed, with the series completed in 1996. Brahms Four is the best East German source the British ever had, but now he thinks his cover has been blown — and he desperately wants to come over the Wall and escape from Berlin before he's exposed. There is only one person he still trusts, British agent Bernard Samson of the SIS (Secret Intelligence Service). So Samson, who retired to a desk job five years before, is thrown back into the field. But but before he can even set out on his mission to help Brahms Four, he realizes there's a traitor very close to him. He must find out who it is … and get Brahms to the West before it's too late.